I am a new Mom to an 8 month old baby boy. He has turned my world upside down in a great way. While I have always loved the holidays – Easter, Halloween, Thanksgiving, Christmas, etc.. I have never approached them in a “decorating” kind of way. With the little person now in our house, I am filled with excitement at the thought of creating special memories –especially the designing and sewing of items for the holidays. 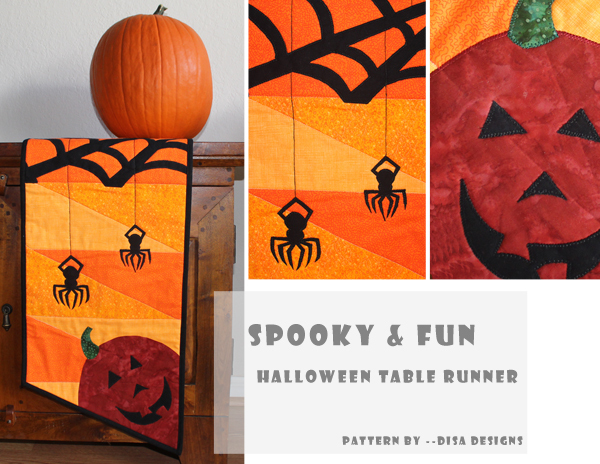 So, I decided to sew a Halloween table runner. I found a class at my local quilting and sewing store and signed up for their seasonal table runner class. What the heck, right? The old me would never have made a bright orange “holiday themed” table runner. But, I thought it would be fun and a great way to brush up on my quilting and appliqueing skills. It was also a perfect opportunity for the new me to create something timless, unique and very seasonal. The pattern we used was from a pattern book called My Runners. Very cute. Check out the designer on her facebook page — She has a quilt and design company called Disa Designs. Even if table runners aren’t your thing, you could update the runners and make them modern by using monochromatic solid fabric colors, soft metallics or even all one color — ie) white! « Inspired by bold graphic prints..
Super cute idea and you’ll have it for years to come. Love the spiders, did you hand stitch them on?